This 145 question packet covers all units on the AP Psych exam. There is an amazing 93 minute review video on YouTube that my students and I discovered a couple of years ago and I have since implemented it as a Spring Break homework assignment for my AP Psych students. I generally give it out a week before Spring Break in case students want to complete it prior to break. He reads from great notes but they were not made accessible. I decided to create a video guide for my students to use while watching it and this is the final product. I have used this the past 3 years and my students have all thought my question packet was very helpful with review. I do not complete this in class because it is fast paced, it might require some pausing to write, and there are numerous questions. I know it is a lot (and trust me...I watched it several times in making the worksheet :)) but it is a great tool for review. I also give a quiz over the video guide once back from break. They do not use the packet on their quiz and it is another way to test that they have watched and reviewed the material. The completed packet also serves as a great study guide. Included is the 145 question worksheet and answer key. 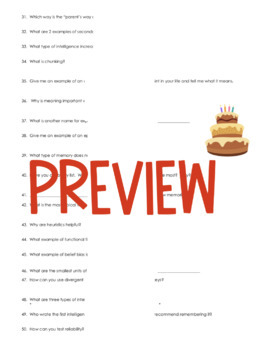 I have also included the 30 question quiz and answer key. OPENER ACTIVITY- I also have an AP Psychology Exam Review Openers available in my store as well. You get six openers for $3! By purchasing this item, you agree to use it for your individual classroom use only and will not post online or share with others. Additional licenses are available for a reduced price.